An emergency blood transfusion from one reindeer to his younger brother saved Little Buddy's life just in time for Christmas. Little Buddy, a five-month-old reindeer in Shortsville, New York, fell violently ill after catching a dangerous tick-based disease. Reindeer owner Mike Schaertl first discovered that one of his reindeer wasn't feeling well when Little Buddy became lethargic and stopped playing with his older brother Moose. Little Buddy is a 5-month-old reindeer from Shortsville, New York. He fell violently ill with Babesios, a tick-borne disease that attacks animals' red blood cells and could be fatal. 'When I came home from work one day to check on Little Buddy, I noticed his urine was dark red,' Schaertl said. 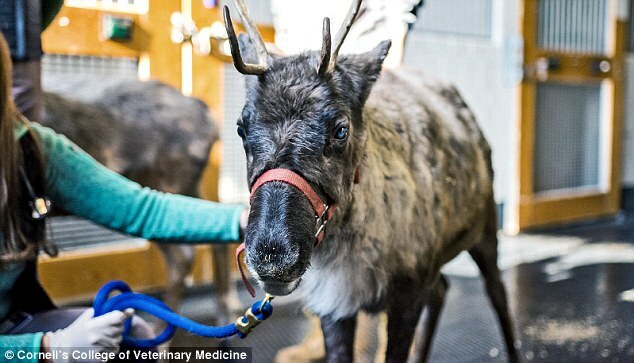 He rushed Little Buddy to the Cornell University Equine and Nemo Farm Animal Hospital in Ithaca, New York, where veterinarians diagnosed the reindeer with a parasitic disease called Babesios. The disease, which is spread by ticks and attacks red blood cells in animals and in rare cases humans, made Little Buddy severely anemic. The high fever and rapid loss of energy are similar to the symptoms caused by malaria. 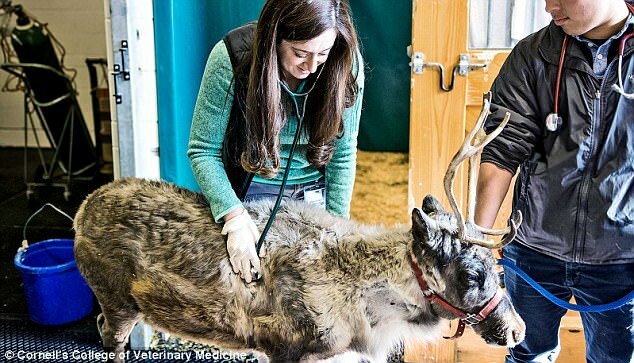 Even though the hospital's veterinarians gave Little Buddy some medicine and kept him overnight at the intensive care unit for animals, the reindeer's health was still growing progressively worse. 'We were very worried about Little Buddy. 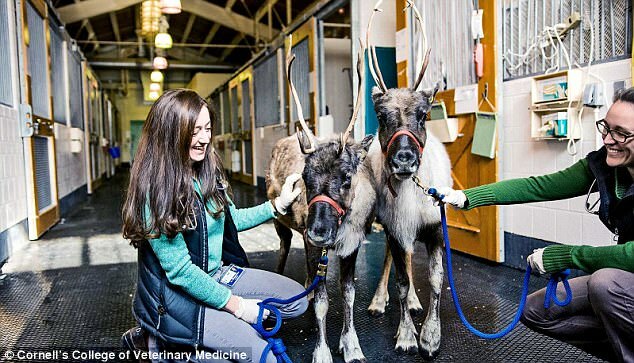 Most reindeer that present to the hospital with this disease do not survive,' Melissa Fenn, the hospital's resident animal internal medicine specialist, told Futurely. Little Buddy, a 5-month-old reindeer from Shortsville, New York, fell violently ill after being struck with a potentially fatal tick-borne disease. Babesios is a parasitic disease that attacks animals' red blood cells and makes them severely anemic. After Little Buddy grew weak and lethargic, his owner rushes him to an animal hospital near their town. Veterinarians gave the reindeer a litre of his older brother Moose's blood in an effort to save his life. The transfusion went well and both reindeer were able to make it home in time for the holidays. The disease caused Little Buddy to grow a fever and lose energy very fast. After his owner rushed the reindeer to an Ithaca animal hospital, veterinarians gave him a litre of his brother Moose's blood to save his life. As a result, the hospital made the call to give Little Buddy a litre of his half-brother Moose's healthy blood in an attempt to save his life. The blood transfusion went well for both Moose and Little Buddy, who started to feel better almost immediately after. During his recovery, the animal hospital built a special fitted stall that brought in cold air and had no bars or grills that could hurt Little Buddy's horns. 'The hospital team was so creative and came up with a great solution to keep him as comfortable as possible during his recovery,' Fenn said. A day after the transfusion, Little Buddy started to stand on his own and eat independently. In a week, the reindeer had been rid of the blood parasites that made him ill, no longer required oxygen, and had started playing with Moose. After a week in the hospital, Little Buddy's health improved to the point where he could leave the intensive care unit and start to play with his older brother again. The two reindeer were able to make it back home just in time for Christmas. The rapid improvements in health meant Little Buddy and Moose could both be moved out of the hospital and, eventually, back to their home in time for Christmas. But as happy as Little Buddy and Moose were to be home, there were others who were even more glad. Once they returned to Shortsville, the two reindeer were greeted with a 'welcome home' celebration from several hundred of Shaertl's family and friends.